Observations from a tour up Green Butte Ridge to above treeline. HS: 174 cm (67 in). Snow surface on east facing aspects and sun exposed areas: smooth supportable sun crust. 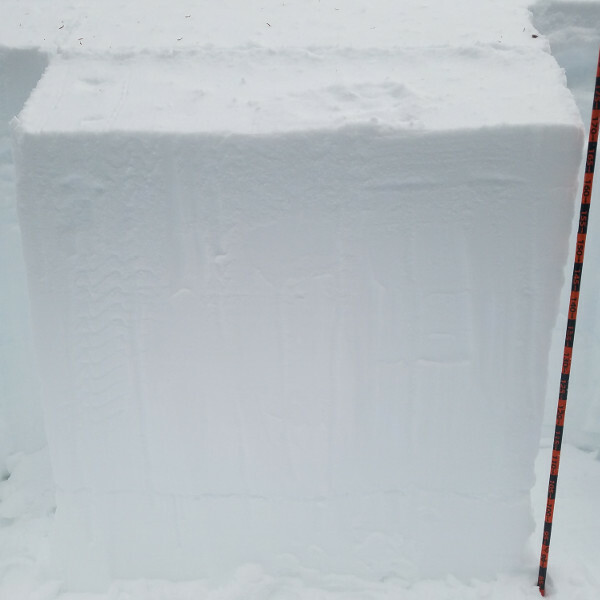 Snow surface on north facing aspects and shady areas: 68 cm (27 inches) of well sintered rounded polyforms atop 5 cm (2 in) crust, ski penetration 5-10 cm, (2-5 in), boot penetration 20 cm (12 in). Hardness down to crust ranging from F to 4F to 1F to K.
Snow surface above treeline on ridges and wide open wind exposed areas: sastruggis and scoured and icy surfaces. Snow surface under trees: hardened by melting falling snow. Stability test results on NW facing aspect, 7800 feet: ECTX. Trees on north/northwest slopes still holding snow. Falling snow from trees hardening snow surface. ECTX - No results in column tests. Rounded polyforms ranging from F, 4F, 1F hardness sitting atop 2 inch K hard crust. Scoured icy surfaces in wind exposed areas. Wind textured surfaces on ridges and wind exposed areas.